You are supposed to learn how to write a dissertation from your professors, from your teachers, and from writing experience, but there are always extra things you can learn. This article doesn’t hold secrets, but it does give you a different perspective on your dissertation writing because this article was written by pooling together information pulled from our own writers, ex-teachers and ex-professors. See what it is like to be on the other side of the marking pen and discover what experienced teachers and professors wish they had told you before they became full-time writers for PaperWritingPro.com. Instead of writing your own essays, dissertations, and assignments, you can let our writers do all the hard work while you do something more productive with your time. Our professional dissertation writers at PaperWritingPro.com will work on your project, they will create 100% original work, they will not plagiarize, and our service is completely confidential. Do not fall behind other students when you can have our degree-qualified experts do all the tough stuff for you. Your dissertation plan may be the most important part of the writing process. It is imperative that you spend a lot of time getting it right because it will guide your success for the rest of your dissertation writing experience. Remember that this isn’t a quick essay that you are writing the night before it is due. Dissertation writing is a very long process, which means your outline/plan needs to guide you, and it needs to be simple enough so that you do not forget where you are or what you have done between writing sessions. Start with your basic principles and check to see if there is enough research material on the Internet to cover your basic principles. Do not bother snipping out large chunks of text to go through later. All you do is note down the source information of each interesting source so that you may come back to it later (e.g. source title, link, page number, etc.). Once you are sure you have enough research material, you can plan your dissertation knowing that you will not come unstuck halfway through. You now need to make a few assumptions about the direction your dissertation will go. You need to have a fair idea of where your research will take you and what sort of conclusions you will be reaching. This is so that you may flesh out your plan and direct your research. Things may change as you go along, and if that happens, you need to change your plan in tandem. Your plan is not a token piece of text, it is your guide for the next few months. When most students ask our degree-qualified experts at Paper Writing Pro to “Write my dissertation for me,” it is usually because they have run out of time, which seems silly because most dissertations have deadlines that are between three and six months, so what went wrong? What went wrong is that the student didn’t have a schedule allied with his or her writing plan. Your outline/plan is one of the most important parts of your dissertation writing journey, but it is useless if you do not have a writing schedule. A writing schedule is a plan where you plan exactly how much time you are going to spend on your dissertation. It notes how many hours you are going to spend per week, and it notes which days of the week you are going to work on your dissertation. It should sync up with your plan/outline so that you can see how far you will be in your plan during the coming weeks. Your dissertation schedule also has place markers that say how much writing you should have done per session and per week, and markers to suggest how far you should have gotten with your dissertation by each week. These place markers are important because you need to know how far behind schedule you are when you are writing. For example, if you planned on writing 1000 words per week, and you are only writing 300 words per week, you know you are behind, and you know you are going to miss your deadline. Since writing a dissertation is not a simple process, you have to allow for weeks where research will come first and weeks where writing will come first. You need to plan your time out carefully or you will discover that you run out of time very quickly to a point where you start needing an essay writing service like ours. Plan your time, and you are less likely to ask us to “Write my dissertation for me.” Plus, if you have a plan, but things go terribly, your plan will tell you how far behind you are. This means you can get your project to us sooner rather than later, which means you can give us a longer deadline. Give us a longer deadline, and the price we charge will be significantly less than if you give us a short deadline. Take note of the instructions given to you by your professor. Your college/University/class may have its own formatting rules on your title page. Make it as short or as long as you wish, but if it starts to look too long, ask yourself if you are adding things that could be better saved for later. The biggest dissertation proposal mistake is to have a very undeveloped aims and objectives section. It doesn’t need to have passion, but it needs to give your dissertation a good reason for existing. This is the section where you show your research methods and give the sources or inspiration for your research methods. As mentioned earlier, you may also have to justify the methods you chose. Part of this is linked with your methodology. This section depends upon what your professor wants. You may have to show your primary research material, or you may have to show that you understand the scope of the subject. A topic is only as covered as you allow. There are always more details, more to know and more to learn, so you need to define the parameters in which you are going to work and show that you have an endpoint. The constraints section is often lumped in with the scope section. Your scope section shows where you will stop, your constraints section shows where you may have to stop because of one limit or another. These are the resources you have and may include the resources you wish to have. The resources you wish to have may range from time in the lab to funding. The key to writing a good dissertation proposal is to find a way to do as much as possible with the resources you already have. Remember that your timetable may include the practical side and the written side; your professor may want a timetable for all the work together or a timetable for each element of your dissertation. This is where you place your outline to show that you have a plan for your dissertation. Be aware that your professor is also looking for signs that you have made your mind up prior to doing the work because your professor wants to you be at least part-way unbiased when you write. These are the references for your proposal and not for your dissertation. However, double check that fact with your professor because he or she may be looking for a reading list rather than a list of references you used for your proposal. 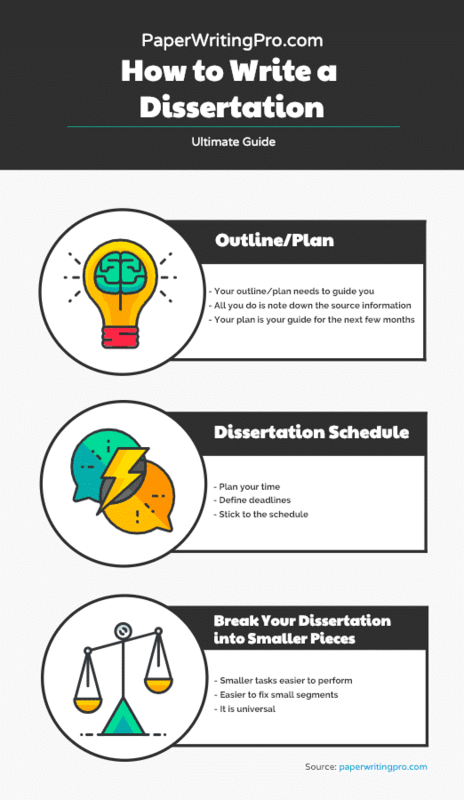 The biggest elements in how to write a dissertation are the planning and scheduling, but there are other elements that make it easier. Working on your project every day or every other day is a very good idea because you quickly forget what you wrote and what you have researched already. Students often repeat themselves or contradict themselves in their dissertations, and they do it because they forget what they have already written. For a similar reason, you should also keep your plan and your outline up to date. Make notes on it to show where you are with your work. Write a small note in red under each paragraph. It needs only be a sentence long. Write it in red under every paragraph in your dissertation, and its job is to briefly describe what has been said in the paragraph. When you look over your work at a later date (maybe you have a week’s rest before getting back to it), you need not read the entire thing, you may read the red notes under each paragraph. When you have nearly finished your dissertation and you are about to write your conclusion, you need to cut the red sentences from your pages and put them on a separate page. That page of red text will then be a great help when writing your conclusion because you will know exactly what you have written, so you will know what to mention in your conclusion. We all know the dissertation writing process is a difficult one. If you are having trouble, you do not need to give us your entire dissertation to write. You can write most of your dissertation, and then give us the tricky, annoying or boring stuff. For example, some students come to us because they do not know how to write acknowledgment for dissertation or how to write an abstract for a dissertation. Do not be afraid to break the dissertation down into smaller sections that you knit back together when you are nearly finished. If your sections do not contradict or repeat each other, then this may be a legitimate way for you to turn a large dissertation task into a series of smaller-easier tasks.